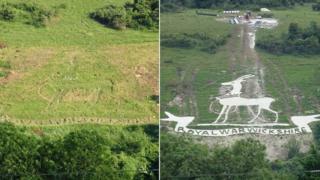 A giant "invisible" chalk landmark has been restored to a Wiltshire hillside. The emblem of the Royal Warwickshire Regiment was carved into the chalk in 1916 by soldiers stationed near Sutton Mandeville during World War One. It had been maintained along with the military badges at nearby Fovant until the 1990s, but has been lost from sight in the last 20 years. Following an £88,300 Heritage Lottery Fund (HLF) grant, the emblem has now been restored to its former glory. The 100ft (30m) regimental emblem was dug out on Sutton Down by members of the Royal Warwickshire unit stationed in nearby training camps. Up to 2,000 soldiers were based at Sutton Mandeville and the Royal Warwickshire regiment was one of the first units based there, according to John Gailey from the Sutton Mandeville Heritage Trust. "We always knew it [the regimental badge] was there but over the past 20 years it was neglected and it gradually disappeared under the scrub and undergrowth and was pretty impenetrable," said Mr Gailey. "Our objective was to recreate - as far as possible - the original badge but it was very difficult work on a 45-degree slope." After volunteers cleared the undergrowth, a drone survey was carried out to "map" the badge and a specialist contractor brought in to cut the outline of the antelope and banner beneath it. "We pegged in a honeycomb geotextile into the hillside and put the chalk in that," said Mr Gailey. "The geotextile will hopefully prevent the chalk from slipping down the hillside." Work has also begun to restore a second badge on Sutton Down, for the 7th (City of London) Battalion of the London Regiment - known as the 'Shiny Seventh'.